Russian scientist Konstantin Tsiolkovsky conceived of many of today’s advances in aeronautics at a time when they could only be considered science fiction. Russian scientist Konstantin Tsiolkovsky (1857-1935) is considered one of the fathers of rocketry and aeronautics. As a result of a childhood bout with scarlet fever, he was almost totally deaf and therefore unable to attend school. However, the education he obtained on his own coupled with his creative and unconventional thinking led to him to ideas that at the time seemed like something beyond the realm of fantasy. And yet, today some of Tsiolkovsky’s dreams have already become reality and the others, as if they are just waiting for their time. One of Tsiolkovsky’s first innovations was his own design for a dirigible. Although it was never realized, it attracted attention from the biggest names in science. Tsiokolvsky’s design was distinguished by the material from which the flying machine’s membrane was to be made: the rubberized fabric was replaced by metal which meant that dangerous chemical reactions could be avoided. By carrying out experiments and making calculations the scientist came to the conclusion that only a flying machine made out of metal would meet the requirements in terms of comfort and safety, and be economically viable. The idea that made the scientist world-famous concerned flights not on Earth, but into space. In his 1883 work Free Space, which is written in the form of a diary, Tsiolkovsky introduces readers to a narrator who is free from the forces of gravity. The narrator determines that rocket propulsion is the only means of transportation in space. Tsiolkovsky’s idea for an elevated guiding ramp to launch rockets was not useful for space rocket systems, but it has been used in advanced weapons development. Russian multiple launch rocket systems such as Katyusha, Grad, and Smerch use this technology. The scientist later explored this concept further in an academic work, The Exploration of Space By Means of Rocket Propelled Devices. Tsiolkovsky substantiated his conclusions using the simplest laws of mechanics and proved that rockets are capable of undertaking a space flight. Tsiolkovskiy used the term “rocket train” to describe the ancestor of multi-stage rockets – compound rockets that would take off conventionally from Earth and then fly upwards and orbit in space. Once each stage of the rocket had used its fuel, it was to disconnect and fall back to earth. According to the scientist’s calculations each rocket should be 30 meters in length and 3 meters in diameter. 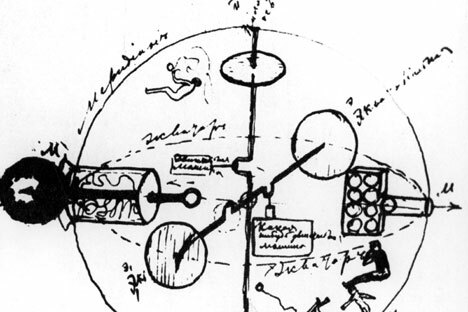 Tsiolkovsky did not consider rockets the only way of travelling beyond Earth’s boundaries. He had the idea to extend a cable from a spaceship to the Earth’s surface to pick up cargo. If this idea was ever realized, it could save money and eliminate the risk of losing rockets in a launch. Tsiolkovskiy was an avid supporter of man’s exploration of space. In his vision of the future, space travel was inextricably linked to theories concerning the advancement of man. He imagined that once man had achieved harmony on earth, he would begin to explore other planets. He also thought a great deal about the biomedical problems man would face in space. It was Tsiolkovskiy who first proposed using special suits to protect humans from the effects of the space environment. In his science fiction story Beyond the Earth, Tsiolkovskiy formulated the idea of colonies in space, proposing a design for a rotating structure that would create artificial gravity. The scientist believed that industrial and agricultural production could be accommodated in space colonies and whole urban communities developed. Today this idea has found fulfilment in the Toroidal Space Colonies project (to put it more simply the ‘rotating space stations’) being developed by scientists at Stanford University.